What does it cost to get the best in-home assistance and care services in the area? Our rates are no secret. Our professional intake coordinator will customize a plan to fit your needs with the best caregivers available in your area. We are here to accommodate you and your family's needs and our team managers are available 24/7 to assist with any life needs. We are here to serve you, our client, and understand that life happens outside of normal office hours. Every family is special to us and serving the needs of our community through professionalism and compassionate care has been the foundation of our services since 2006. In 2005, after many years of caring for aging relatives who had experienced falls, Alzheimer's, and other health difficulties, Sherry Cole and her daughter, Kerri, decided to form a non-medical home-care company in Joplin, Missouri. With a background in Education, Clinical Chemistry, and Biology and five years of working with the Alzheimer's Association office in Joplin, Sherry frequently had clients with a need for home care. At that time all she could do was give them a list of 250 caregivers from local hospitals. Although helpful, finding the right caregiver was a time-consuming task; and families had to wait for assistance. Kerri's diverse background in Healthcare Administration, Senior Health Insurance, and Veterans' Aide quickly proved valuable as the company expanded into Kansas and Oklahoma. As business grew, other needs arose. Leaky faucets and burnt-out light bulbs needed to be fixed. At this point, Sherry’s husband, Jerry had just retired yet wanted to help out so his handyman skills were put to use. In addition to carpentry and plumbing, Jerry was a Vietnam War veteran with a background in finance and marketing. Upon Jerry and Sherry's retirement, Kerri became CEO and further expanded the company's service to any individual of any age who needed home-care. 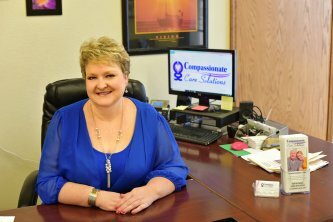 The company name was changed to Compassionate Care Solutions in 2017 to reflect that expanded mission.